In 1858 14 children from Yatton Keynell attended Castle Combe School as shown in Warburton’s school census. He also reported that up to 30 younger children were being taught in a dame school. The vicar was actively raising subscriptions to build a school to accommodate 50 scholars. In March 1859 the new school was completed and between 40 and 60 children were being taught by an uncertified mistress. By October 1878, average pupil attendance had grown to an impressive 83. However, the lack of accurate school registers meant the attendance officer was not clear on how many pupils were supposed to be in school. It was not uncommon in the 1860s for the school to be used for missionary meetings. If so the children would be granted a school closure in the afternoons to prepare. In addition the school building was sometimes used for village Christmas concerts as recorded in the school log books in 1877. When it came to general election time, in 1885, the school was transformed into a polling station. School logbooks gave the impression of a disruptive school, however, one must bear in mind the masters of the school, expected good behaviour and only felt it necessary to record details of misbehaviour. There were accounts of lectures on ‘truth telling’ in the beginning of 1866. However, more academically speaking, throughout the school’s history, inspection reports have quoted the ‘backwardness of the children’ from infants to the upper class. The master was very much astonished when in May 1871 he ‘admitted a (10 year old) boy who cannot read’. September of 1878 the master recorded ‘no more than 10 out of 35 infants know the letters of the alphabet’. A couple of months later this was elaborated and it stated the 11 infants who will be 6 next May 8th are unable to point out or write single letters. As a result by January 1866, the master introduced timetables, which were frequently revised on in accordance with pupils’ progress. On occasion when attendance was poor pupils were put together into one class. Examples of what pupils learnt included weights and measures; this was introduced later into the curriculum in 1866. Over the years more and more was added into the curriculum and apart from the basic 3Rs – reading writing and arithmetic – subjects included scripture, poetry, memory lessons, writing class, tables, needle work, music, dictation and singing. The subjects were taught on chalk and slate but the school was supplied with new books to allow pupils to finish their sums and other work at home. Desks were also supplied in the late 1860s. The pupils, it was reported, were very excited at the arrival of new exercises and new slate pencils in summer of 1871. The church has been constantly empathised throughout the school’s history and the vicar was closely involved in the school. For a number of years there were at least weekly sessions at the local church in addition to Saturday or Sunday and divine service. Their religious knowledge was forever tested via exams or orally in lessons. In particular after 1879, there were ever more references made to church. As previously mentioned, there were naturally mischievous pupils and these were punished, though specifics of punishment have gone unrecorded. In latter years of the 19th century there were a few documentations of discussions between headmasters and the doctor with regards to the severity of punishments. The police in 1877 had to come to the school to caution two young boys on bird nesting. Other punishments occurred because of a girl throwing dirt, obstinacy, and spending school pence (for which the mother insisted the school proceed with ‘heavy punishment’). More seriously there were punishments to ‘bullies for wilfully cutting a little ones arm with glass’. Some punishment was given in the form of spending extra time in school, which usually meant after school detentions as demonstrated in 1878 for disobedience in lessons. One may argue this behaviour caused staff changes. Yatton Keynall has seen a substantial amount of changes, in particular that of head master/mistress. One mistress left for Grittleton School, allowing for another mistress to take over role. A year later, this mistress left to get married. Then within 4 years there were 5 mistress changes. The latter left for a position in London offered to her by the Committer of St Georges, Battersea. Notably, in 1878 John E Mitchell and his wife commenced work as master of the school, they seemed to have thought badly of the school by referencing pupils as ‘children very backward’ particularly noting scripture and tables being their worst subject. As a result, the logbooks showed how the master immediately ordered new books for the upper classes, new slates with lines for the lower classes. Home lesson books were also ordered including geography and grammar books. Though this was not all, a committee met to complete the new classroom and put in several new desks. In spite of the master’s efforts, Mr Blake on Easton Piercy farm, refused to send his children to the school “until school rooms [were] in proper conditions”. Among other refurbishments and improvements to the school was the introduction of a new stove in one of the classrooms. In contrast the inspectorate of schools commented in their annual report in 1879 ‘a very great change for the better has been affected’. May of 1881 saw the school decorated with a new clock and a bell. Until 1891 parents paid fees for their children to attend school and when the school did not receive the school pence, pupils were sent home. Parents were also fined if children did not attend. Two parents were fined 2/6d (12½p) and 5/- (25p) for their children’s absence. Yet the school did not have accurate pupil records and contacts were limited. In 1897 the school attendance officer actually threatened a family with legal action if the pupils didn’t attend school. In 1878 many discrepancies in the administration of the attending pupils were found. The school attendance officer took the names of those regularly absent; the register showed there should be 75 pupils and for many an incorrect age was given. One year, days before an examination, it was found one girl’s age was wrong and she had to be removed from the exam. Absences were scattered throughout the year for various agricultural duties. In March in 1869, a few pupils were off bean planting. April was a cause for potato planting while pupils went hay making in July. Furthermore, markets in nearby towns instigated absences such as those in Chippenham and Castle Combe. In May 1866, a troop of soldiers marched through the village causing a low number of pupils within the school, though there was more of a disturbance to attendance when the foxhound meeting commenced. For other sports, a couple of pupils were absent from school due to the Hullavington races, and were subsequently punished for doing so. However, attendance was allowed for one meet of the Beaufort Hunt, which was held in the village. Strangely enough it was noted on 4th November 1878 there were ‘generally fewer children on Monday than any other day of the week’. Any other absences such as for general labour work required a certificate of labour; this could be part time, or full time if a sufficient level of educational attainment had been reached. When one family failed to show the certificate for their child, the child was ordered to return to education. Another major cause for absences was diseases or ill health. With Yatton Keynell being a small village, and there not being the high level of vaccinations, good sanitary conditions or means of prevention of diseases, it wasn’t uncommon for most of the school to fall ill. One example was from measles in the winter of 1880. It contributed to the school having its lowest ever attendance in 2 years of only 23 (nearly ¾ of the school ill!). Consequently, this meant lessons had to be specially made for the remaining pupils, who represented a wide range of ages. The school suffered many illnesses over the years. From severe colds to measles, to the mumps, to the itch. Chicken pox, chilblains and whooping cough was also recorded in the school logbooks; not forgetting severe cases of scarlet fever. In 1882 the school recorded its first on site death, it was written that ‘during dinner hour today the child accidentally met his death by falling into the pool’. Interestingly though, this is the only reference to a pool. When there was bad weather, attendance was inevitably affected. Snow and heavy rain made the journey to school difficult, particularly for children whose parents could not afford to buy them warm and waterproof clothing and stout boots. Bad weather affected mostly those children from Giddeahall or West Yatton who lived farthest from the school. Poor conditions allowed pupils residing a long distance away to leave at 4pm rather than 4.30pm. Half-holidays were awarded for a number of events, for example in 1871 for the teachers to attend the choral festival in Chippenham. On a rare occasion the school has been closed for the day to be cleaned. One year, pupils were given a day’s holiday to attend the annual choir festival. The Queen’s Jubilee caused a stir with celebrations in the village; the following day the jubilee festivities were at Chippenham. Another Royal occasion affecting the school day was the Royal wedding in July 1893 for which a celebration tea was provided for the children! Annual holidays have varied considerably throughout the years. Harvest holidays were generally 4-5 weeks long in the summer. A holiday scheduled over Christmas caused the most distress for pupils. Generally this was for 2-3 weeks but a rather strict master in 1877 refused a Christmas holiday, with only Christmas day itself off, due to a 6 weeks holiday being given at Harvest time. Easter, Whitsun and Good Friday warranted further holidays. However, teachers were sometimes reluctant to allow long summer holidays as the infants in particular forgot what they were taught. This is because, unlike modern educational time tables, the school academic year ended 30th April rather than the end of July. On 6th May 1879 the first examination with answers written on paper was conducted on the second standard. It was something of a privilege in the 19th century to have a formal certificate and for this one certificates were awarded to those who passed and given the following December. From the introduction of exams it seemed the school was able to aim to a target and at the annual inspection the report suggests there was steady progress being made. By 1907 the school had an average attendance of 70 pupils and under the guidance of headmistress Mrs S. Southgate this number had risen to an average of 80 by 1911. At this time the school was taken over by Wiltshire County Council. The school continued with slightly fluctuating numbers during the first half of the 20th century. In 1918 the school leaving age was raised to 14 but the school remained an elementary school, teaching all ages from 5 to 14; a few children from the village did go to secondary school in Chippenham. In 1943 there were 71 children on the school roll and at times this was increased by evacuees; in 1944 there were six evacuees for a time. All children had their gas masks inspected at regular intervals and there were also regular visits form the school nurse and sometimes the school doctor. It was in 1944 that the County Council Education Officer felt that the school was overcrowded and suggested that all children aged 11 and over should be transferred to Chippenham Senior School. This was agreed and on 27th April 1945 18 senior children were moved to Chippenham leaving 40 juniors and infants at Yatton Keynell. The following month, on 8th and 9th May those 40 enjoyed a two day holiday to celebrate Victory in Europe. Interestingly, in January 1946, eight double desks were transferred to Lea and Garsdon School; doubtless not needed after the senior children had moved out. The school continued teaching local children, although numbers fell as young families moved out to find work in the towns as jobs in farming declined. In 1981 there were only 32 children at the school and in 1985 and 1986 this fell to 27. From then numbers slowly rose and a mobile classroom was added. Numbers peaked in 1995 when 52 children were on the school roll. At this time they had the use of the Victorian buildings, a mobile classroom, a playground, a field and the school pond. 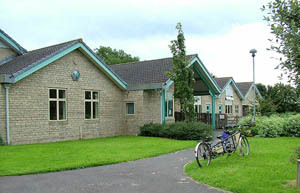 The village hall was also used for indoor activities and the village field for team games. In the 1990s it was decided to amalgamate fours schools with small numbers of children on their rolls in the area and build a new school at Yatton Keynell, on the village playing field. Yatton Keynell School closed at the end of the summer term 1998. In 1998 the four existing schools at Yatton Keynell, Biddestone, Nettleton & Burton, and Castle Combe were closed and the children moved to the new school in Yatton Keynell. For the first two months of the academic year 1998/9 the children were taught in temporary accommodation as the opening of the building was delayed. They eventually moved to the new school in November 1998, where they had the benefit of six classrooms, four of which could be used as two double units to provide flexibility, a library, hall, field, and adventure play equipment. In 2001 there were 148 pupils on the roll, with more girls than boys in most classes. Numbers remained fairly steady in the first five years after opening but dropped to 110 in September 2005 and in May 2007 stood at 106. In 2004 an extension was built to accommodate the new ICT suite. After leaving the school at the end of Year 6 pupils go to comprehensive schools in Chippenham or Corsham.